We have discussed how abandoned carts are captured using Abandoned Cart Lite for WooCommerce plugin. Today we will move a step ahead and understand the default settings associated with this plugin. Now let us understand the parameters of each of these settings in detail. This is the cut-off time set for logged-in users, guest users and visitors after which the cart will get abandoned if the order is not placed. The carts will be captured for all types of users after X minutes on cart abandonment. The default cart abandoned cut-off time is set to 10 minutes. This setting is the most vital of all as it helps admin to keep track of number of recovered carts. A notification will be received by the admin once an abandoned order is successfully placed. Hence for the admin to receive the email for order recovery, this setting has to be enabled by ticking the checkbox. The default setting for this is unchecked. You need to tick the checkbox to enable this setting. There is a provision to start tracking of abandoned product or carts if customer does not visit the Checkout page. The carts are tracked even when the customer does not enter any of his personal details on Checkout like Name or Email address. So it means that once this setting is enabled, the tracking will begin from the time the visitor adds products to the cart and visits the Cart page. This setting is enabled by default. But if this setting is unchecked, carts will not be tracked if visitor does not reach the Checkout page or refuses to enter customer details on the Checkout page. When reminder email is sent to the customer, the ‘From’ Name of the email is the name from whom the email has been sent to the customer. The name in ‘From’ Name field is set to admin by default and can be changed to any other name while assigning the template. This field represents the email address you want the email to go from, to the customer on cart abandonment. 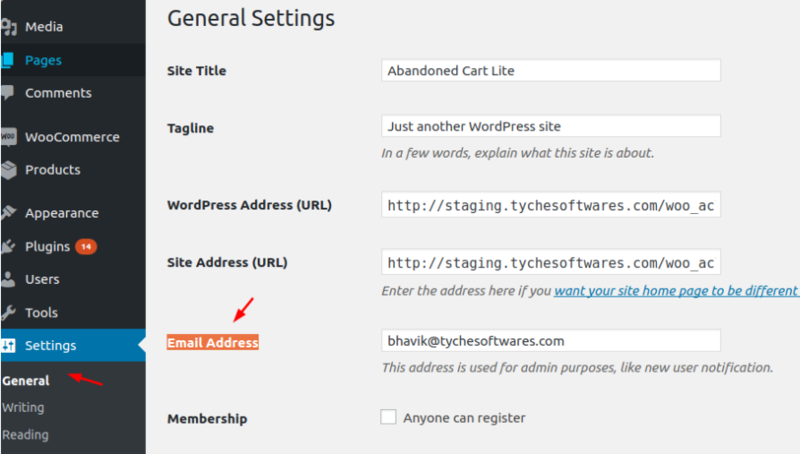 The abandoned cart reminder emails are sent from the admin’s email address by default and can be changed to a different email address while assigning the template. Here an email address has to be entered to whom the reply emails of the customer will be sent to. This again is admin’s email address by default and can be changed if required.